Participants run during the half marathon event in Berlin on Sunday. The German daily Die Welt is reporting that police have foiled a knife attack on the half-marathon in Berlin. The paper says special police forces detained four men in connection with Sunday's sports event. They said the main suspect was planning to killed participants and spectators with knives. 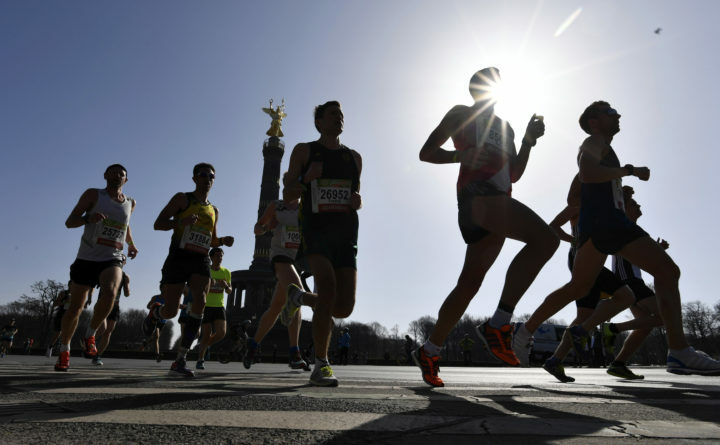 BERLIN — Six people were detained in connection with what police and prosecutors allege was a plan to carry out an attack on Berlin’s half-marathon Sunday, German authorities said. “There were isolated indications that those arrested, aged between 18 and 21 years, were participating in the preparation of a crime in connection with this event,” prosecutors and police wrote in a joint statement. Berlin police tweeted that six people were detained in cooperation with the city’s prosecutor’s office. Die Welt reported that the main suspect, who was not identified, had prepared two knives to use in the attack. It also wrote that in one of the searched apartments, dogs trained to find explosives barked when they were taken into the dwelling’s basement.